iPhone 2.2 Firmware Download Now Available in iTunes! iPhone 2.2 firmware is now available to download via iTunes! It seems as though the rumored predictions of 2.2 coming out on the 21st were partially correct because the release came out around 10:30PM PST (but it would be 1:30AM EST, November 21st). What’s included in this firmware update? Well, no big surprises here folks but you’ll now see Google street view (not available in all cities–any Canadian cities? ), public transit and walking directions, direct downloads of podcasts via the iTunes app, along with other fixes and stability to Safari and Mail. * Click here to read the update security enhancements. Like we talked about yesterday, do not update to 2.2 firmware if you care at all about the iPhone 3G software unlock. The iPhone Dev Team will shortly be reporting on when it will be safe to update to 2.2 and have a functioning iPhone 3G software unlock. As for myself, I’m going to try holding off updating (of course this is going to be easier said than done) to 2.2 firmware because I’m really curious and interested in an iPhone 3G software unlock, since I have some future travel plans coming my way. Using my iPhone 3G overseas will be extremely useful! On the other hand I also desperately crave the new fixes and stability improvements to Safari and Mail. Hmm…what to do? • Addresses a quality issue creating MP3s on some computers. 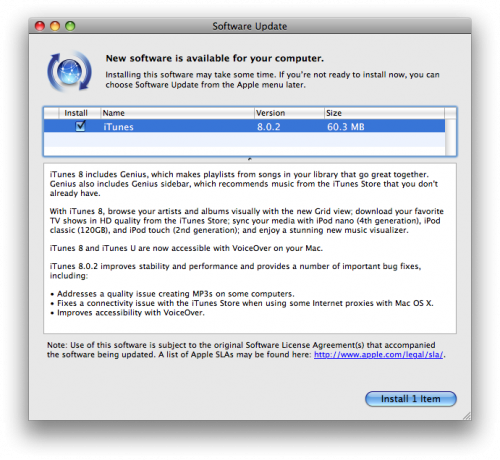 • Fixes a connectivity issue with the iTunes Store when using some Internet proxies with Mac OS X. • Improves accessibility with VoiceOver. Wow, two big updates in one night by Apple. 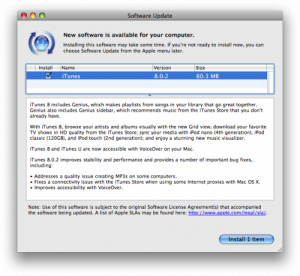 First iTunes, then 2.2 iPhone firmware! Be sure to let us know how the 2.2 firmware update goes in the comments!